NEWS: A ceremony to erect a Blue Plaque took place at 11am on the 7th April, 2001 at 16 King's Hall Road, Beckenham to commemorate the time he lived at that address. Click here for more details. It has been suggested that Colour Sergeant Bourne DCM took promotion instead of a VC. He ended his career as Lieutenant Colonel Frank Bourne OBE DCM. He is buried in Beckenham Cemetery and Crematorium, found on Elmers End Road on the A214, details of location can be obtained from the lodge on entering. Railway station close by is Birkbeck. The grave is in plot T7, facing West, row 5 near to the war memorial. (There is a car park). Click here to read the transcript from 'The Listener'. 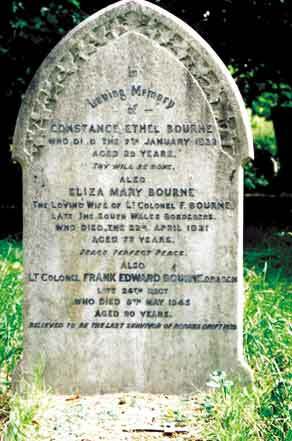 Born in Balcombe, Sussex in 1854. He enlisted at Reigate on 18 December 1872 aged 18 years 8 months. Promoted Corporal in 1875, Sergeant in 1878 and Colour Sergeant in April 1878. 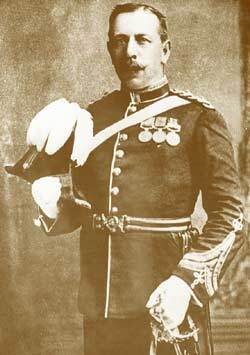 He was aged 24 years at the time of Rorke's Drift - certainly a regimental 'high flyer'. He was awarded the Distinguished Conduct Medal with £10 annuity. After Rorke's Drift, he served in India and Burma. Promoted Quartermaster-Sergeant in 1884. He was offered an immediate commission after Rorke's Drift, but he declined - however was commissioned in 1890 as a Quartermaster. In 1893 he was appointed Adjutant of the School of Musketry at Hythe in Kent. He retired from the Army in 1907. During the Great War, he rejoined and became Adjutant of the School of Musketry in Dublin. At the end of the war, he was given the honorary rank of Lieutenant Colonel and appointed OBE. He was a mourner at many of the funerals of Rorke's Drift defenders. In 1936, he made a radio broadcast about the defence of Rorke's Drift; sadly no tape survives, although there is a transcript. He was the last defender to die on VE Day 1945 - 8 May - he was aged 91. (His medal group is in the SWB Museum Collection).